inundated with light thanks to the many windows, some opening on wide, nice views over the red-tiled roofs of Florence and overlooking a garden on the ground floor. None of the windows opens on streets, making the apartment extremely quiet. Last but not least in Florence: all windows are equipped with mosquito nets. The apartment is located at Piazza Ciompi, in the heart of Florence, in Sant' Ambrogio, a lively area, very much within walking distance of all monuments and museums. Sant' Ambrogio is a foodies' area offering plenty of cafes, pastry shops, street food and restaurants for all budgets and tastes. The famous open-air food and vegetable daily Sant’ Ambrogio Market is one block from the apartment. Also very close are supermarkets and food shops. Hello everyone, I have always been very fond of travelling and meeting new people from around the World. Therefore I think that I know very well what travellers need when away from home. Piazza Ciompi is very central (a short and pleasant walk of Ponte Vecchio and the cathedral) and yet- so far -still spared from the throngs of people cramming in the very heart of the city. This area (Santa Croce / Sant' Ambrogio) still retains a deep local flavour. This area is especially sought-after by "foodies" because of the wealth and variety of its food scene featuring restaurants (for all tastes and budgets), street food, cafés, pastries and the famous Sant' Ambrogio food and vegetable market. Bathroom with w.c., bidet, tub and shower. Living and dining room with 2 sofas, one of which can be opened and turned into a double bed. This was the perfect place for our visit to Florence. Many restaurants close by. Easy walking distance to many attractions, museums and shopping. Peter was the best host one could hope for. He provided many suggestions as to what and where to visit. Definite come back place !! I enjoyed my stay immensely. Close to great restaurants and cafes, and it was easy to walk to the major sites. It was also quiet, which meant it was easy to sleep at night or relax in the sunny apartment during the day. Peter was an excellent host, helping with the bags on arrival and in touch to make sure everything was in working order in the apartment. He also had helpful lists of restaurants, museum hours, and the like. A great place to stay. Perfect apartment in a perfect location with a perfect host. 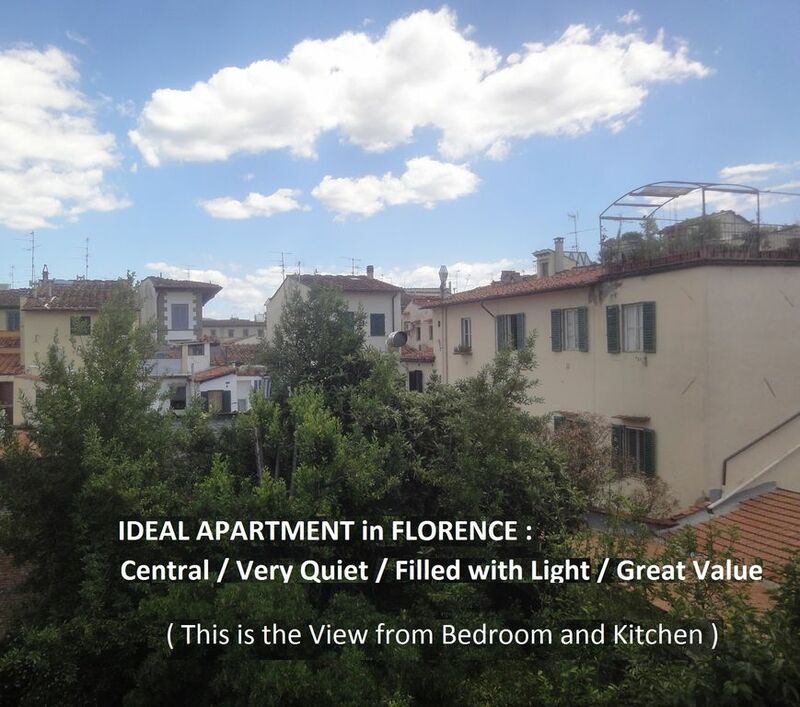 This is a roomy, comfortable, quiet apartment within walking distance to everything you will want to see in Florence. One particularly nice thing is that it is in a "less touristy" area, but still just a 5 minute walk to the Duomo. There are great shops and restaurants just outside the door. However, one of the most wonderful aspects of staying here is the host, Peter. He is my favorite Tuscan travel source-from day trips, local restaurants, to travel within the city. I will miss my conversations with him. So much helpful information from such a lovely man! Arrived at the apartment well after check in time, to find property had no heating in the middle of winter. After a long day of travelling and given it was well after 7:30pm my youngest daughter wanted to go to bed however people were in the property attempting to resolve the heating issue and thus felt extremely uncomfortable and had to vacate the property. When the property owner discovered the heating was not working, you would expect it would be courteous to advise the guest as soon as possible, given the issue could not be resolved prior to guest arrival and thus giving the guest an opportunity to make a decision whether or not to cancel the accommodation and receive a refund. We left as there was no assurance the issue could be resolved, have requested a refund via homeaway and have never received a response from the property owner. Appalling to say the least. The review submitted by that lady is incorrect and unjust because it totally misrepresents facts and omits the most important one: the fact that the minor problem that had occurred with the heating (while I waited for her) was solved within 60 minutes of her arrival and temperature was quickly going back to normal. The lady in question witnessed all that but nevertheless she decided to leave and stay with some local friends, notwithstanding my profused apologies and my offer to compensate her for that initial and short discomfort by waiving the charge for 1 night of the 3 that she was supposed to stay (and for which she had only made the initial payment). Therefore I am sorry but I believe that the claim for a refund has no ground because the fact that the lady in question did not stay at my apartment depended on her own personal (and perhaps a little precipitous) decision. As a matter of fact, perhaps I am the one who would have reason to lay claims because my place ended up empty for 3 of the most rentable days of the year (New Year's period). Luckily the many excellent reviews left by guests who stayed at my place after and before that unfortunate incident are ample evidence that mine is indeed a very comfortable apartment. The apartment is located on the east side of the city, so you are not in the middle of all the craziness. However, it is a very short walk, 10-20 minutes to all the major sites. The apartment is located in the back of the building and is very quiet; you do not hear any street noise. It is perfect for 2-4 people. The neighborhood has a plethora of great restaurants (the Cibreo restaurants and market owned by Fabio Picchi are around the block) and down the street is Divina Pizza, which might make the best pizza I have ever had. Around the block is a semi-open air food market (This is not THE Central Market) that has great seafood, meats, and vegetables along with a wonderful restaurant. Stay here for four days, buy the Firenze card(people standing in line will get very upset with you when you cut the line with the card, it's worth every penny just for those reactions), overdose on art and architecture, eat at some local restaurants, enjoy the gelato, then go home; you will be overwhelmed, but in a good way. One suggestion, spend the 10-15 euros and get a cab from the train station especially if you are not familiar with Florence. If you are semi-fluent in Italian, you can probably figure out the bus schedule and use a local bus to get to and from the train station (I think it is Bus # 14, which stops near the apartment). BTW, thanks Peter for your insight into activities in the city, especially the Museo Novacento; it was a nice break from all the Florentine art. The apartment was well-located and within easy walking distance to everything. It was clean and neat and, though not luxurious, had everything needed for our stay. The elevator in the building is not available for use so plan on using the stairs to the second (third) floor. Fantastic restaurant area right at our doorstep. Peter was extremely helpful and provided lots of information and tips so we could make the most of our three days there.